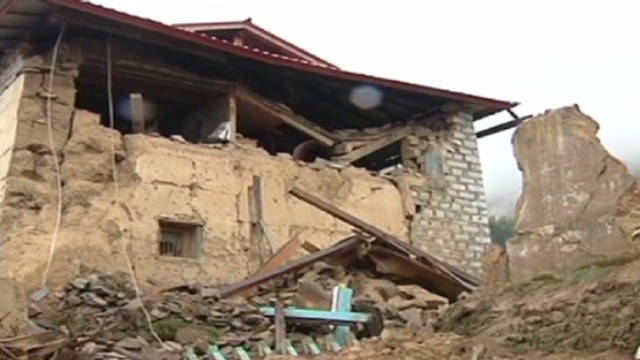 New Delhi (CNN) -- The death toll from a magnitude 6.9 earthquake -- and its aftershocks -- along the border of India and Nepal climbed to 21 Monday, officials said. Fourteen deaths were reported in India with seven others in Nepal, according to each nation's Home Ministry. More than 90 have been injured in India. The quake struck the northern Indian state of Sikkim, where seven people died, causing damage in West Bengal, Bihar, Assam, Arunachal Pradesh and Meghalaya. Five deaths were reported in West Bengal and two others in Bihar. The dead include three in Nepal's capital of Kathmandu, who died when a wall of the British embassy collapsed, according to Kedar Rijal, Kathmandu police chief. They included an 8-year-old girl, her father and a third person. The British Foreign Office confirmed a "compound perimeter wall" of the embassy collapsed, adding that its ambassador has met with the community and offered condolences. Police said in a statement that two more people died in the Nepalese town of Dhara, about 217 miles east of Kathmandu. About a dozen people were injured when they jumped from their houses during the quake, police said. The locations of the other two fatalities were not immediately available. Communications to stricken areas are "much better now," Sikkim's chief secretary Karma Gyatso said Monday, adding cell phone connections have also improved in the northern Indian state. He added that rescuers have reached most of the hardest-hit areas, with more emergency crews set to be deployed over the course of the day. Already, 300 civilians had been rescued in one such effort near Sikkim's border with China, said Indo-Tibetan Border Police spokesman Deepak Kumar Pandey. Some 22 tourists -- all of them Indians -- were also rescued in the same area. The deaths, damage and recovery efforts came after a total of three quakes struck the region in rapid succession in a mountainous region. The U.S. Geological Survey initially put the largest quake at 6.8 magnitude, later upgrading it to a 6.9, and the other two at magnitudes 4.8 and 4.6. All three occurred within an hour and 15 minutes, the U.S. agency said. The India Meteorological Department said the quakes were 6.8 magnitude, 5.7 magnitude and 5.3 magnitude. The quakes set off landslides, which -- along with heavy rains -- were blocking roads and hampering rescue efforts, Pandey said. He expressed fears that the toll, as far as deaths and damage, could be more than is now known, anticipating more will be known once the sun rises Monday. Authorities have reported power outages and downed phone lines in Sikkim. Emergency crews were dispatched from different locations to the region, India's home ministry said in an alert to reporters. At least four fighter jets were carrying rescue officers to a neighboring region, where they travel by road to Gangtok, Sikkim's capital, according to the alert. As for outside help, World Vision announced Sunday that it "has put its emergency response team in India on standby" to provide relief as requested. The nonprofit organization reported that the quake cut off phone communication and electricity in parts of Sikkim and West Bengal provinces. "The whole earth was shaking and it lasted for two minutes," Paul Mathai from World Vision, who was 130 kilometers (80 miles) from the epicenter, said in a statement from the organization. "We were panicked, but all of us are safe." That quake's epicenter was about 42 miles from the city of Gangtok and 169 miles east of Kathmandu, according to the geological survey. CNN's Harmeet Singh, Manesh Shrestha and Bharati Naik contributed to this report.